Originally, this recipe was supposed to appear in a May/June vegan publication, but that never came to fruition; they ran out of room in their international cuisine issue. Ah, well. I spent time perfecting it, so it seems only right that I share it with you all! Before you attempt this recipe, though, consult my troubleshooting tips. I gained lots of wisdom that may help you in your macaron-making journey. Also, consult my first recipe for a helpful supply list. I really like playing around with floral flavors, but the best piece of advice I can give you about it is -- less is more! Really! You only need three drops of lavender oil in this recipe, otherwise they start to taste like soap. The oils are so highly concentrated that a little goes a long way. Check food specialty stores for food grade lavender oil or you can order Lavender Vitality from Young Living. It's been about a year since I fully jumped on the essential oil bandwagon and I'm so happy that I did! In a small saucepan, bring your chickpea liquid to a boil. When it boils, lower the heat and allow it to simmer/reduce for 10 solid minutes - set a timer! This boiling liquid will smell weird, FYI. You want it to reduce to about 1/3 cup. Cool this mixture for 10 minutes, minimally. Measure out your regular sugar. Set it aside. Once your chickpea liquid has cooled, pour it into your stand mixer bowl along with the Cream of Tartar and attach your whisk. Turn the mixer on to a medium-high setting (about a 5-6 setting) and whisk for 2 solid minutes - set a timer! The mixture should get frothy and foamy. When your meringue is done, fold in the sifted mixture in thirds. (Pour one-third in and fold. Repeat.) You want it to be a thick, firm batter; but you also want it to be a little shiny. Someone likened it to lava flowing slowly down a mountain, but I'm not sure what sense that makes. This is the stage that you just have to get the knack for. This is why macaron-making is challenging! You'll need to fold the batter at least 40-60 times; if your arm doesn't hurt, you're not doing it right. Consult my troubleshooting page. Pipe cookies the size of a quarter/half dollar onto your Silpat mats. Repeat piping the batter until you run out of batter - or room. Allow the macarons to dry on the counter for 2-3 hours. For real. They should be dry to the lightest touch - don't poke them, haha. Bake the macarons for 30 minutes. When the 30 minutes have elapsed, turn the oven off and let the cookies sit in the closed oven for 20 minutes. After those 15 minutes have elapsed, open the oven door and let them cool for another 15 minutes before removing them from the oven. Combine the ingredients in a medium-sized bowl and use a spatula to combine. If you need a little more liquid to get the icing together, add a little almond milk to the mix, about a tablespoon at a time. Using another piping bag, gently pipe the icing onto one side of a macaron. Grab another macaron and sandwich them together. (I like to call it the reverse Oreo method. You know, when you were a kid and you "unscrewed" the Oreo cookies? Well, twist the macarons to make them go together!) If you have some leftover, save it in the freezer for another use! Put the macarons into the fridge (an air-tight container) and let the flavors marry overnight -- they taste so much better the next day! Store in the fridge, but let them warm to room temperature before eating them. 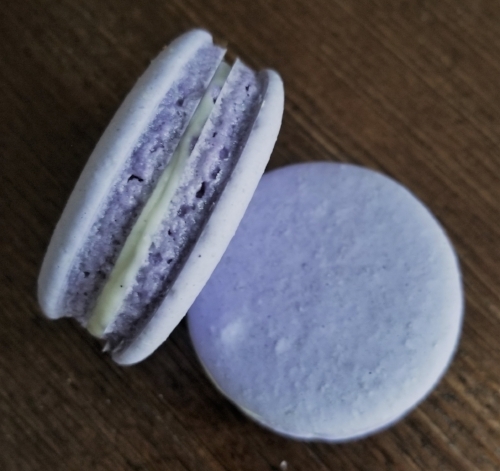 I hope you enjoy these macarons and get to know the process a little better!